According to a survey conducted by the American Academy of Cosmetic Dentistry, more than half of the U.S. adult population over the age of 50 believes that a person’s smile remains one of the most attractive features even as they age. However, keeping our teeth straight and white can become more difficult later in life. Like bones, teeth become more brittle the older you get and are prone to chips, cracks, and falling out. This can affect your self-esteem and others’ perception of you. Fortunately, cosmetic dental care can help you keep your smile looking great even as you age — without the need for dentures! A cosmetic dentist can help you fix the appearance of your teeth in as little as a single office visit (after a consultation, of course). If you have chips in your teeth that ruin your smile, but your dentist has determined your teeth are strong enough, consider asking a cosmetic dentist about dental veneers. Dental veneers are thin, porcelain covers that go over your teeth to give the appearance of a perfect tooth. First, your cosmetic dentist will construct the veneer to fit your tooth. Then they will carefully remove a thin layer from your tooth so that the veneer will bond better to the front of your tooth using a kind of cement or resin. After the veneer has been successfully bonded, the dentist will then sculpt the veneer so that it suits your tooth perfectly. Similar to veneers is teeth bonding. The process of teeth bonding uses similar resin as veneers, but the cosmetic dentist will not place a small cap over the front of your tooth. If you have a gap, teeth bonding is used to fill the gap with tooth-colored resin that bonds to your teeth. The dentist will touch up the resin once it has been applied and then use ultraviolet light in order to harden it. After polishing the resin to ensure it doesn’t irritate the inside of your lips, you’ll be all set to go with a beautiful smile. If missing teeth are ruining your smile or making it difficult to eat or speak, dental implants can be a viable option. Dental implants can take a while longer than veneers to place in your mouth, but they’re definitely worth the procedure to restore your smile. Dental implants are fake teeth that are implanted in your gums. If your dentist has determined that your jaw bone is strong enough to undergo the surgery, an oral surgeon will drill into your gum in order to create a space for an artificial root. 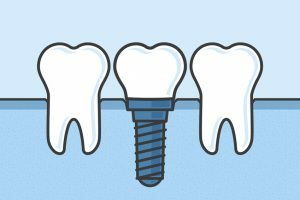 Once the hole has healed, the surgeon will implant an artificial root that resembles a screw. When the jaw and gums successfully heal around the root, the dentist will then place an abutment on top of the root that will serve as a kind of false tooth before being capped with a porcelain crown identical to a real tooth. Consider choosing cosmetic dentistry if your smile is causing you to lose confidence and self-esteem as you age. With veneers, teeth bonding, and dental implants your smile can stay perfect for years without the need for dentures.